Identify patterns or trends in data. Develop a meaning for and identify outliers in a data set and verify. Making a Stem and Leaf Plot - An excellent interactive assignment can be found at the bottom of this page . When a set of data is changed, identify effects on measures of central tendency, range, and inter-quartile range. Explore quartiles, deciles, and percentiles of a distribution. Construct and interpret various forms of data representations, (including line graphs, bar graphs, circle graphs, histograms, scatter-plots, box-and-whiskers, stem-and-leaf, and frequency tables). Scatter Plot Applet - This applet draws a scatter plot of points (a,b), where the data is taken from an input table. The table is on the left side of the applet and can be edited by the user. Draw qualitative graphs of functions and describe a general trend or shape. Compare two data sets using graphs and descriptive statistics. Examine real-world graphical relationship (including scatter-plots) to determine type of relationship (linear or nonlinear) and any association (positive, negative or none) between the variables of the data set. Real World Mathematics - One of the challenges facing mathematics teachers is convincing their students that there is a place for mathematics in the real world. The goal of this page is to collect examples of those applications. This is a SCORE (Schools of California - Online Resources for Educators) page. Using Graphs, Equations, and Tables to Investigate the Elimination of Medicine from the Body: Graphing the Situation This three-part example illustrates the use of iteration, recursion, and algebra to model and analyze the changing amount of medicine in an athlete's body. Determine an equation for a line that fits real-world linear data; interpret the meaning of the slope and y-intercept in context of the data. Using technology with a set of contextual linear data to examine the line of best fit; determine and interpret the correlation coefficient. Use an equation that fits data to make a prediction. Use techniques (Venn Diagrams, tree diagrams, or counting procedures) to identify the possible outcomes of an experiment or sample space and compute the probability of an event. Probability Theory: The Layman's Guide to Probability - An in-depth but easily readable guide on probability theory, covering various aspects of the theory� with a bias to gambling games and strategies. Includes working examples in an excel spreadsheet. Determine the complement of an event and the probability of that complement. Determine if two events are independent or dependent. Explore joint and conditional probability. Identify situations for which the Law of Large Numbers applies. Perform simulations to estimate probabilities. Make informed decisions about practical situations using probability concepts. Interpret displays of data to answer questions about the data set(s) (e.g., identify pattern, trends, and/or outliers in a data set). Identify the effect on mean, median, mode, and range when values in the data set are changed. 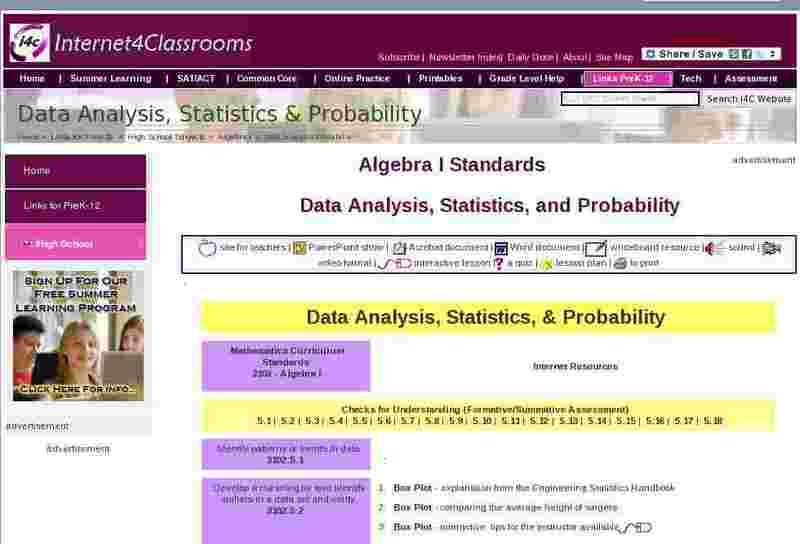 Exploring Histograms - The interactive data analysis tool in this investigation allows students to create their own sets of data and examine how various statistical functions such as mean, median, and standard deviation depend on the choice of data. Using a scatter-plot, determine if a linear relationship exists and describe the association between variables. Generate the equation of a line that fits linear data and use it to make a prediction. Equation of a line: Slope Intercept Form - Adjust the sliders at the site. They control the slope (m) and the intercept (b) of the line. The equation and the line will change accordingly. You can also drag the origin. Practice from Math.com: The coordinate plane, Slope and y-intercept, and Graphing linear equations. Determine theoretical and/or experimental probability of an event and/or its complement including using relative frequency.